In light of some recent comments on my Ka-Bar Mini Dozier Folding Knife post, I decided to see how many backpackers carry knives or blades when backpacking. This is not about what kind of blade you carry, but more simply do you or don’t you. Doesn’t matter if it is a machete, a fixed blade, a folder, a razor blade or what. As long as it is some sort of metal with an edge. 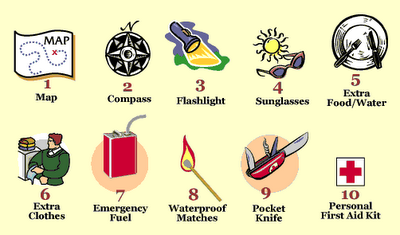 So, no matter what you use it for, do you or don’t you carry a knife/blade when you backpack? This entry was posted in Gear, Knives and tagged 10 Essentials, Backpacking Blade, Backpacking Knife. Bookmark the permalink. 14 Responses to Poll: Do you carry a knife/blade when backpacking? i prefer taking for backpacking. I have gone to Australia with Morakniv Companion Fixed Blade. this gave me a great facility in time wilderness. thanks for your survey. If doing any sort of serious backpacking, you’d be crazy not to carry a small, lightweight and reliable fixed blade knife(look for one with a skeletonized handle if you are weight conscious). A knife is one of the single most important tools for shelter building amongst other survival tasks. John’s advice is just bad. Sleeping with your food is a bad idea period no matter where you are even though many do it. The irritant for me is when this is done in groups. You have 90% of everyone hanging their food and one idiot sleeping with it believing they are immune to the scents of wildlife….and then the bear visits everyone. Hikers should hang their food, pots and pants, and anything heavily scented with food smells (in addition to cooking away from their sleeping site). For arguments sake, I’ll say “or” can it. And as far as OPSAKs go, these bags have ripped on me 100% of the time after about 4 days on the trail. Junk. And this is with a LOT of trail testing. COME ON HIKERS – BE RESPONSIBLE – NOT ARROGANT! Hanging my food is something that I always do at camp. But I must admit that many times I cook near my campsite and especially if I am staying at shelters. However, on my next trip I will be trying a different approach. I plan to hike longer hours on my next trip so my plan is to stop on the trail and cook, then pack back up and finish hiking. The nice thing about this seems to be that once I get to camp, I don’t have to cook, clean and then hang my food, but rather just pitch my shelter and then immediately hang my food. I do agree though, being in a shelter with other people that have not hung their food and choose to keep it inside with them would be a bit unnerving, at least for me. Luckily though I have not been put in that situation, at least that I know of. And in my opinion, I do find that a bit inconsiderate of others in the shelter. If everyone in the shelter wants to keep their food with them, well that’s one thing, but if there is one person that chooses not too, then I would find it a bit rude if people still chose to keep it with them. I look at it this way, the shelters (and campsites to some degree) are shared, so everyone should be considerate of everyone. Heck, I recently purchased another head lamp when mine worked jsut fine, but I did it because it did not have a red lamp. I found it to be quite irritating when some people in a shelter ran around with white headlamps on while others were trying to sleep. For this reason I decided I would get a lamp with a red light. It is just more polite in my opinion. I always carry my knife. I have never been apart of the weight weenie crowd, to each his own. I found on my AT thru-hike that I only used my knife to peel oranges and grapefruit. I could’ve used a tent stake for that and left the knife at home. If I’ve carried a piece of gear for over 5 months and never needed it then its probably safe to leave at home. I now only carry a knife when I need it for whatever I’m cooking that trip. Quite frankly I’m not sure what people are using their knives for out on the trail unless its for a wood stove or food related. Thanks for chiming in, and especially with your experience. As far as me, I have used my knife for a few things, such as cutting cord (this was actually for someone else that hiked into the shelter with the sole to his boot in his hands! I used my knife to cut off a piece of cord rather than use all of my cord). Also, as far as cutting cord, I can picture myself getting my bear line caught in the tree…hasn’t happened yet, but there is that potential (and IMO, for anyone who hangs a bear line). At least with my knife I can salvage some of the line rather than leave it all. Then of course for things like opening food packages or cutting food, whittling wood to get some dry wood when it is all wet and then there is sharpening pencils (which I actually used my knife today while on a day hike to do). For me, I am more comfy with my knife, which is what it all comes down to in my opinion. This is obviously what you have come to find out for you, that you would be comfy with leaving it. I am not so sure that I am ready to sleep with my food. I am still paranoid about bears in general… I did however pick up some more of the OpSaks which I plan to use. I bought the 12×20 (I think, it is the biggest size). I plan to keep all of my food inside one of those. I have a trip coming up soon which I will use it for. But I will still hang it. However, if I stay at the shelters, they do have the cables in place already. I voted “always” as my Victorinox Swiss Army Classic is always with me. It is attached to my Photon II LED. On the pct-l mailing list, this issue came up a number of months back, and a large percentage of the thru-hikers in the UL category said they were not carrying knives (nor did they), instead the put one in their bounce-box to aid in repacking their food.